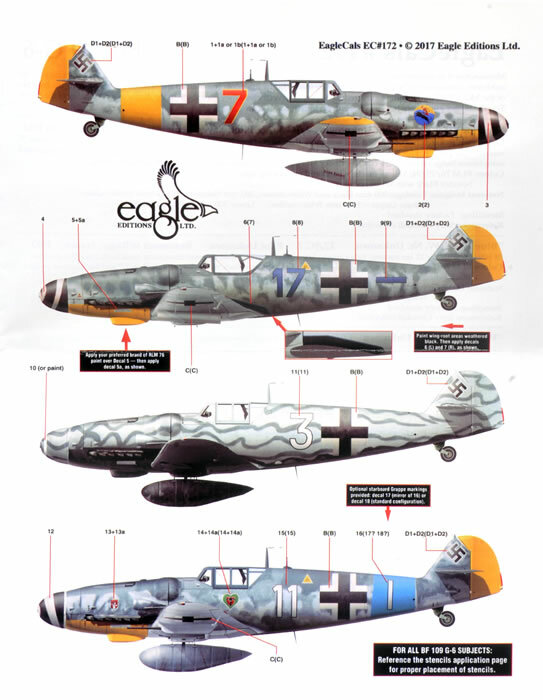 Advantages: Interesting subject choices; includes national markings; comprehensive instructions; high quality decals. Conclusion: These decals offers some interesting and lesser known choices to customise any 1/48 scale Messerschmitt Bf 109 G-6 kit. 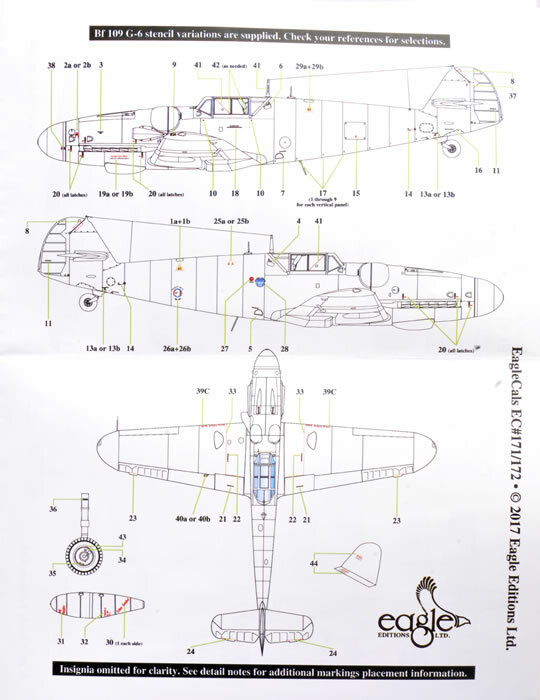 Eagle Editions has just released two new decals sheets for Messerschmitt Bf 109 G-6s. They are available in 1/32, 1/48 and 1/72 scales. I am reviewing the 1/48 scale release. This latest EagleCals' releases have arrived in good time for Tamiya's just-announced and forthcoming 1/48 scale Messerschmitt Bf 109 G-6, but of course they are equally suitable for the excellent Eduard and Zvezda kits, or any other 1/48 scale Bf 109 G-6 kit currently on the market. Tonight we are examining EC#172. The decals are beautifully printed on a single sheet. There is no mention of who printed them but they are in perfect register and colours look good. National markings are provided, including two-part hakenkreuze for the fin. Stencil markings are also provided. The instruction artwork features finely reproduced halftones, weathering plus realistic depiction of light and shade. The large versions of these illustrations are very attractive. In common with earlier EagleCals releases, the research behind these decals and the artwork is very good. 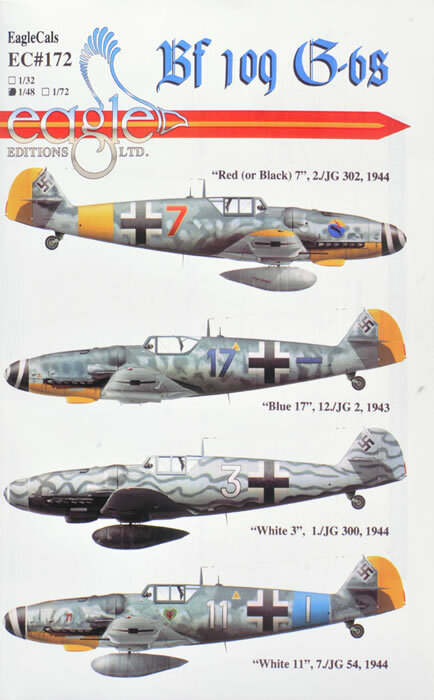 In addition to the colour marking guide, a helpful text description of each aircraft is provided although in this case the Werkenummern and pilots are unknown for the four subects. A full-page stencil placement guide is another useful feature. Three of the subjects feature the early-style framed canopy and short tail, so these will be suitable for the forthcoming Tamiya kit. Three of the aircraft are finished in standard day fighter mid-war camouflage of RLM 76 lower surfaces and RLM 74 Grey Green and RLM 75 Grey Violet on the upper surfaces, The fourth subject a unique night fighter scheme of black lower surfaces, wit RLM overall on the upper surfaces with wavy lines of RLM 75 Grey Violet. 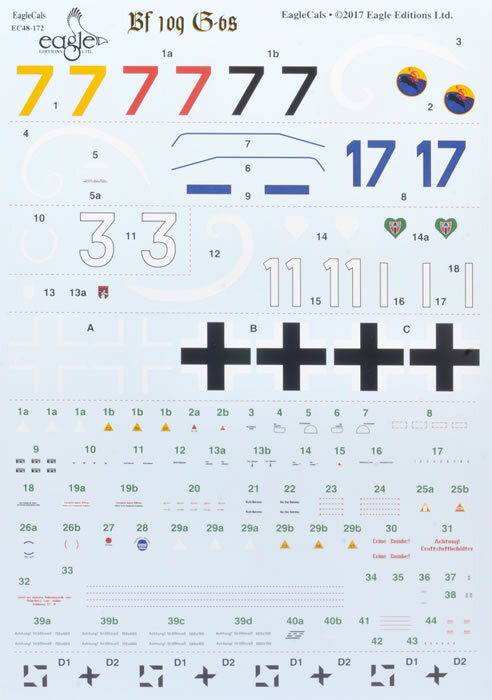 These decals offers some interesting and lesser known choices to customise any 1/48 scale Messerschmitt Bf 109 G-6 kit.